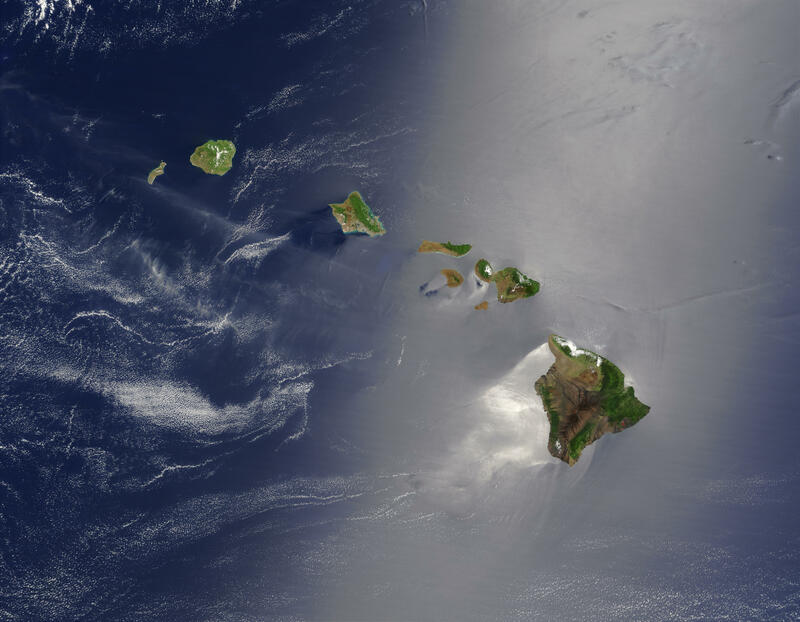 A silver swath of sunglint surrounds half of the Hawaiian islands in this true-color Terra MODIS image acquired on May 27, 2003. 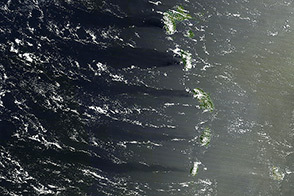 Sunglint reveals turbulence in the surface waters of the Pacific Ocean. If the surface of the water was as smooth as a perfect mirror, we would see the circle of the Sun as a perfect reflection. But because the surface of the water is ruffled with waves, each wave acts like a mirror and the Sun’s reflection gets softened into a broader silver swath, called the sunglint region. 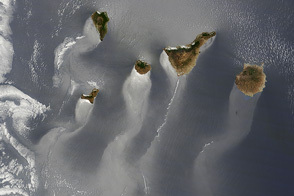 In this scene, the winds ruffling the water surface around the Hawaiian Islands create varying patterns, leaving some areas calmer than others. Southwest of Hawaii and Maui, on their leeward sides, calmer waters are indicated by brighter silver coloration. 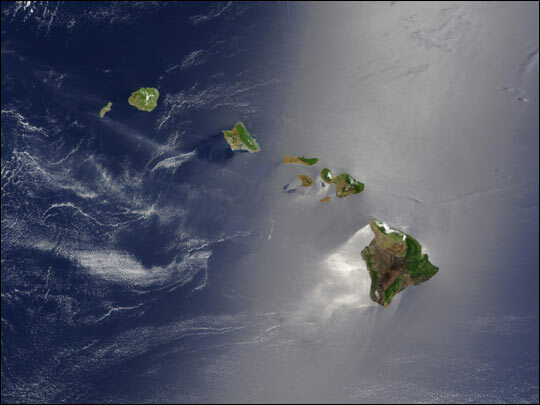 Conversely, notice how most of the vegetation on the Hawaiian Islands grows on their northeastern, or windward, sides. From lower right to upper left, the “Big Island” (Hawaii), Maui, Kahoolawe, Lanai, Molokai, Oahu, Kauai, and Niihau islands all make up the state of Hawaii, which lies more than 2,000 miles from any other part of the United States. The small red dot on the Big Island’s southeastern side marks a hot spot on Kilauea Volcano’s southern flank. Kilauea has been erupting almost continuously since January 1983, and is one of the world’s best studied volcanoes. 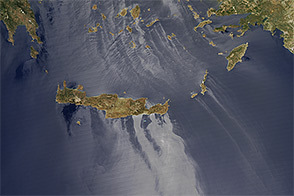 Winds ruffling the water surface around the Hawaiian Islands create varying patterns, leaving some areas calmer than others. On the leeward sides of the islands, calmer waters show up as brighter silver coloration. Conversely, most vegetation grows on the windward sides.